Aloha! One Hawaiian-themed restaurant is giving out lunch for a day for just a QUID. 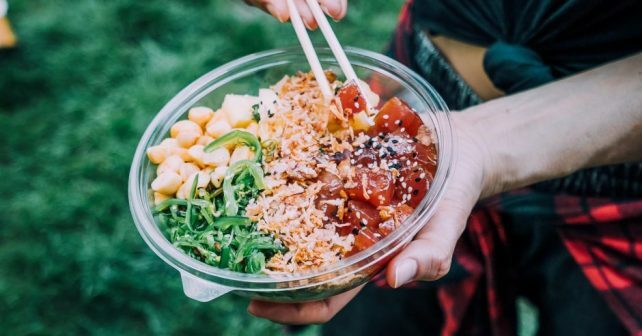 Yep, Island Poké’s next to nothing giveaway is all to mark the opening of the brand’s latest outlet in Shoreditch. Wondering what poké is? It’s a tasty traditional Hawaiian dish of diced raw fish, normally on a base of rice. Guests can just swing by and tuck in to menu staples Yuzu Lomi Lomi (sushi rice topped with yuzu mango salsa, edamame, spring onion, sesame seeds) or the Classic Bowl (with tuna, pineapple chilli salsa, wakame seaweed and crispy shallots). Normally these cost just shy of £8 so it’s a whacking great chunk off the price. You’ll even be able to create your own with any flavour you fancy so get experimental – it all costs the same.